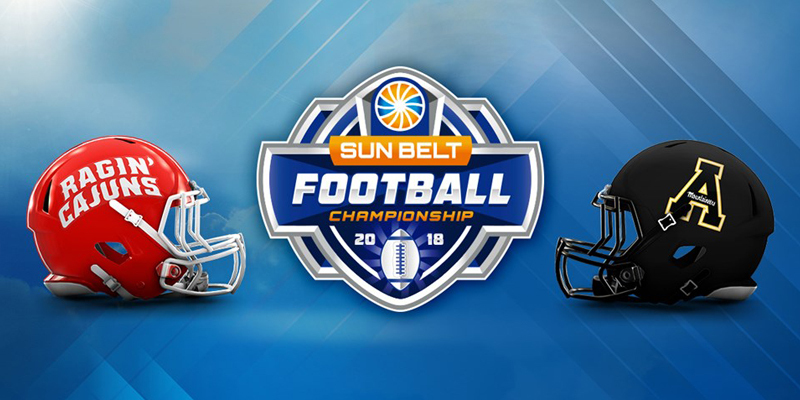 The inaugural Sun Belt Conference Football Championship Game is headed to Boone, N.C. as Appalachian State won its piece of the Sun Belt East Division Saturday afternoon and claimed the right to host West Division representative Louisiana. Kickoff for the first Sun Belt Football Championship Game will come straight out of College Game Day on ESPN at 12 p.m. ET/11 a.m. CT on Saturday, Dec. 1. App State’s Kidd Brewer Stadium will serve as the championship venue when the Mountaineers (9-2, 7-1 Sun Belt) host the Ragin’ Cajuns (7-5, 5-3 Sun Belt). The winner will play in the R+L Carriers New Orleans Bowl on Dec. 15. App State claimed its part of the East Division title by defeating Troy 21-10 on Saturday afternoon. The Trojans and Mountaineers finished with identical conference records, but App State’s head-to-head win placed them in the Championship Game. The Mountaineers also earned the right to host the game as they had a better conference record than the Cajuns. Louisiana heads to the Championship game after a 31-28 win over ULM on Saturday. The Cajuns will represent the West Division regardless of Arkansas State’s result against Texas State Saturday evening. The Cajuns beat the Red Wolves and would win the tie-breaker between the two teams if they finished tied atop the West Division standings. The Cajuns and Mountaineers met earlier in the season with App State taking a 27-17 win in Boone. Darrynton Evans rushed for 183 yards on 26 carries and scored two touchdowns, including a tiebreaking run on a 20-yard reception late in the first half of that game. Online ticketing ordering is available through appstatesports.com or fans can call the App State Athletic Ticket Office at 828-262-2079. The ticket office, located at the Holmes Center, will be open Monday through Friday from 8 a.m. to 5 p.m.
Those without 2018 App State season tickets may purchase a parking spot for $25, if available, when they purchase their championship game tickets. Stay tuned to sunbeltsports.org and appstatesports.com for more information during the buildup to the game.